Unless, Sardar Biglari makes an offer the take CBRL private, I don’t think the stock goes much above $50. 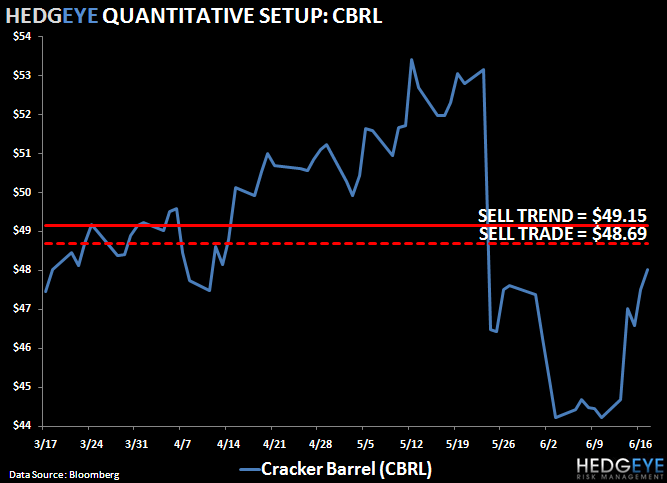 Today, CBRL was sold short today in the Hedgeye Virtual Portfolio. In the 2006/2007, when CBRL faced Nelson Peltz, the stock peaked at $50.74 and in 2007, CBRL generated $225 million in EBITDA versus $228 million in fiscal 2010. Given the secular decline I see in the concept’s business, I don’t see much value past the $50 level, because the cost of fixing declining traffic trends is both time- and capital-intensive. One of the biggest issues is that the company is consistently raises prices in an attempt to protect margins and driving the core customer away in the process. The core Cracker Barrel customer skews older with little disposable income and has suffered from the economic malaise of the past few years. As I said in my CBRL note on 6/16 “I let you be the judge of the company’s performance since the beginning of fiscal 2007 (the last time the company faced an activist investor). The store base has grown by 11%, sales by 2.3%, EBITDA by $3.4 million, EBIT has declined by $68,000 and the share price has gone nowhere. The questions investors need to ponder are: can Mr. Woodhouse fend off Mr. Biglari and what will he do to create value? Will he pursue the same path he did against Nelson Peltz? A transaction we know created ZERO value for shareholders. While we wait the pressure on the core business will persist.